We are home again and Eddie has rolled (twice in rapid succession) and drunk a lot of water and is now grazing happily. We are glad to be home and very happy with how the weekend went. When I brought Eddie out for his morning hack on the hills outside the arena, he was ever so slightly lame on his right hind, which I suspect was from the difficulty at the bank on xc yesterday. I walked him for 20 minutes then tried trot again, but this time in the warm up arena which had very nice footing and he was fine. We let him rest a few hours and when it was time to warm up for sj, he was completely even. The sj course looked like this, including a double, a triple, bending lines in both directions, a really lovely water-filled Liverpool and max fences as far as they eye could see. I warmed up with the help of John Staples and he reminded me about half halting within the rhythm of the canter and keeping my leg on at the base. I reminded myself about keeping my shoulders over my hips at the base of the fence and off we went when our time came. 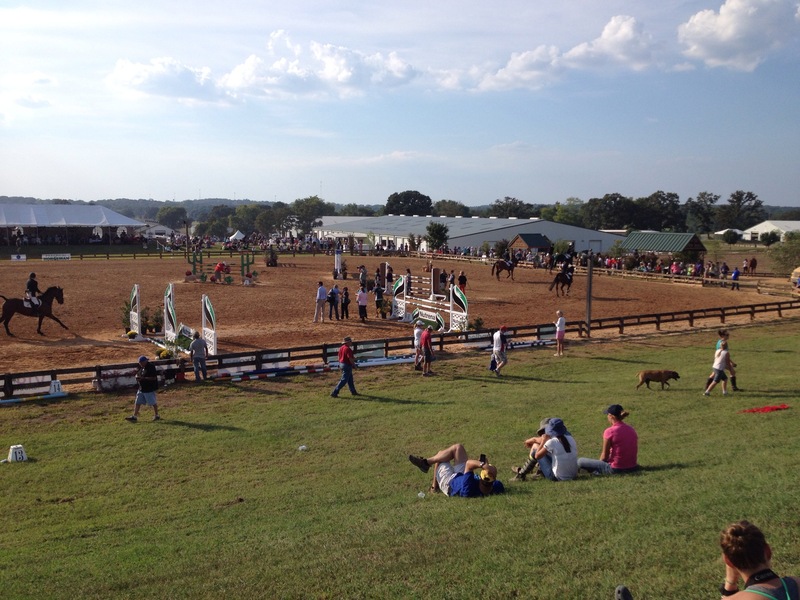 Here is a shot of the course with the intermediate winners doing their victory gallop. I entered the ring and Eddie felt calm and cool. We picked up canter and went to fence one, the cactus oxer, and he jumped that and the next 4 fences well. He pulled 5b with a back leg, nice jump over 6, then pulled the rail at 7, the Liverpool, on to 8 just fine, then pulled 9a, but jumped 9b and c and 10 just fine. The three rails are disappointing, but he was as supple as he’s ever been over a show jumping course. He landed on all the correct leads, he was rateable and felt powerful. All the rails were back leg rubs. I think he needs a little time off or maybe a radiograph of his hocks. The scoreboard says we only had 2 rails, but video, which I will post when I get near my computer tonight, clearly shows three rails. That’s eventing though. Sometimes you get a free rail and sometimes you taste the water in the water complex. Right now we are watching them drag and water the ring before A show jumping. We saw Becky Holder’s fall on xc yesterday and we are glad she seems to be mostly ok, but sad to hear that “Can’t Fire Me” was non weight bearing on his right front. No Bueno. Hey look I figured out how to post pictures from my phone! This is the nekkid trakehner which actually didn’t bother us too much, but it is a fun picture. Xc went swimmingly, with Eddie warming up well and feeling up to the task. The first part of the course went swimmingly and he felt great. He dropped into the the second water beautifully, but then tripped hard up the bank. I kept going straight with him past the C element and did the black flag option which he did well, but it took a lot of time. We continued on to the trakehner above, which went well as did the entire rest of the pretty tough course. He jumped beautifully. 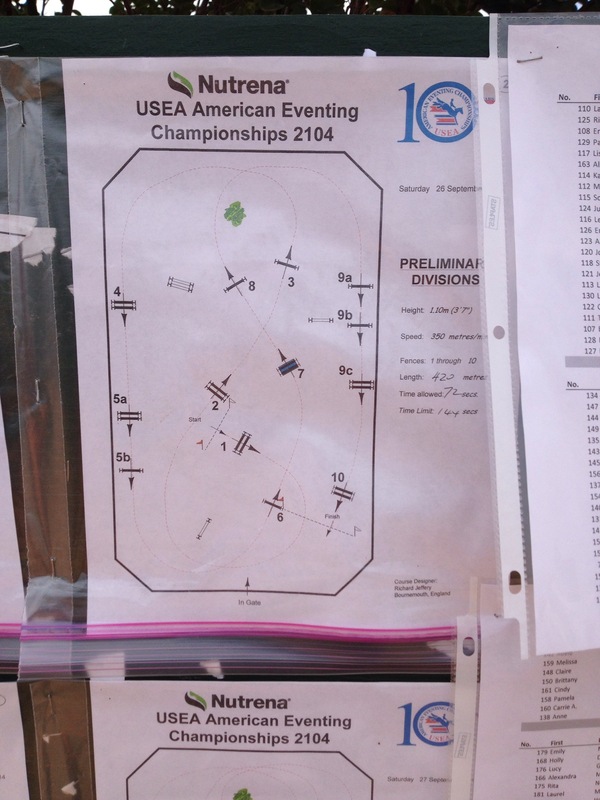 We earned 7.2 time faults, all due to taking he long route at the water, probably. I moved down to 8th and my team moves up to third. Very very happy with how xc went! 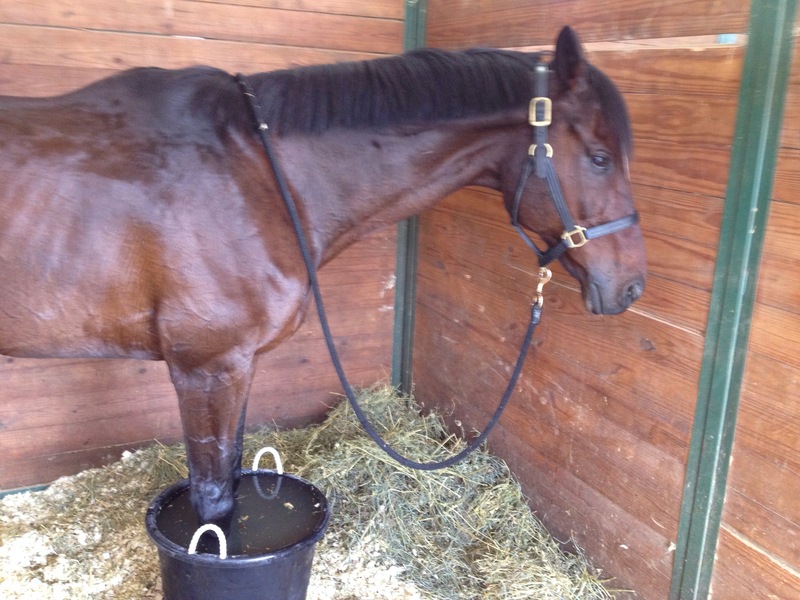 Eddie is enjoying an ice bath and cookies! Dressage went well yesterday! Eddie warmed up well, proceeded to get tight and resistant late in warmup, and then Camie remembered that posting in warm up is a good thing. Eddie relaxed and became nicely rideable again one horse before our ride time. Gotta like that. During the test we kept things flowing and mostly through and I was happy with it. The judge at E gave us a 70.9% and C gave us a 65.something %. Translated to 32ppts to put us in 6th. Pretty happy with that because these judges weren’t giving anything away. Low score 27ish. Ir eally though rough it would be 21 or so. 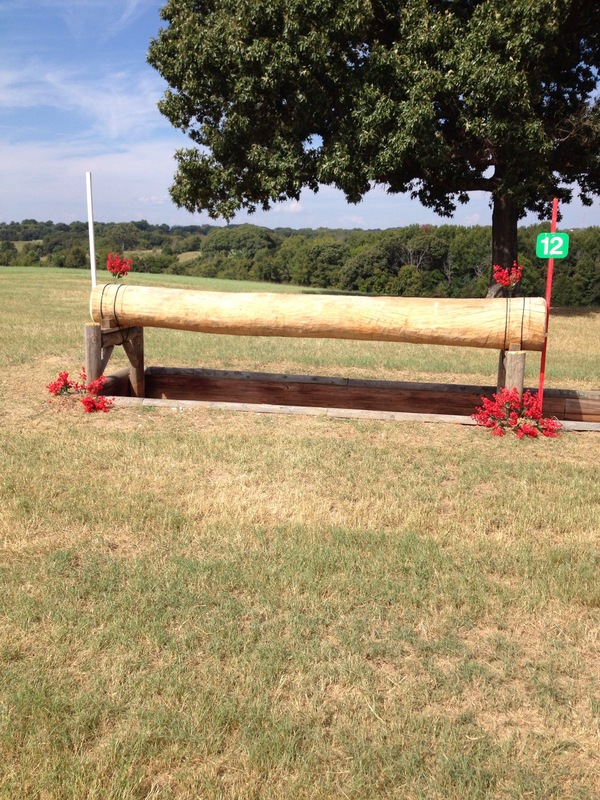 The cross country course has 7 combinations and plenty of tables to jump. There isn’t a lot of places to gallop after fence three. 15ab is a small vertical bending two to a max drop. I am doing this on my phone and I don’t know how to post pictures from it. Sorry! 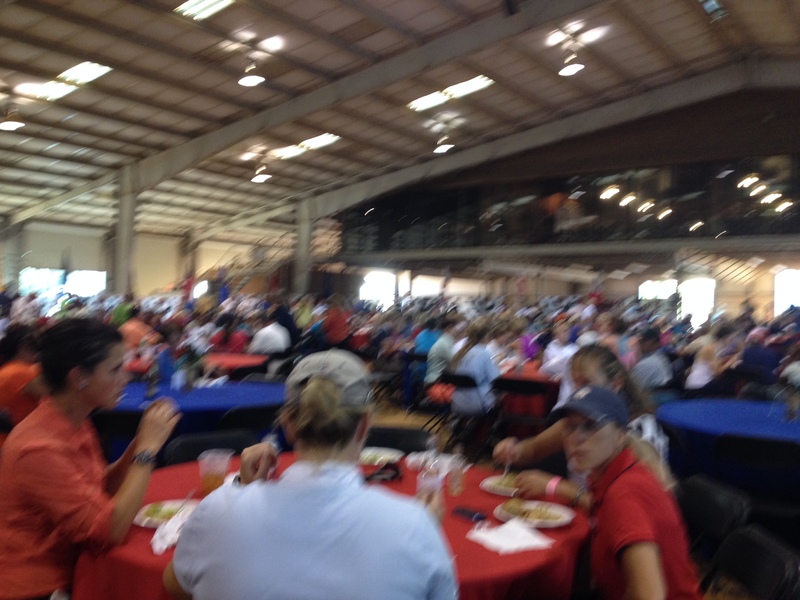 The prelim division starts at 11:30 and I ride at 12:54, so I am going to go out and watch fence 15ab and see how people are riding it. I hacked Eddie this morning and he feels good. Yay! Stoked. Impressive! I wonder what their sock drawer looks like. We were on the road at 0315, which means that I was up and feeding at 0215. Eddie ate a pretty decent breakfast, though all the horses were blinking their eyes and wondering what the early meal was about. Eddie loaded on the trailer fine and we met our friends Chris Arnold and Sara Caruso about 45 minutes out. They were blinking and wondering a bit too, but our plan was that we wanted to get through KC before rush hour, and we did. Because of our early start, we were ravenously hungry by 10:00 and finally found a Taco Bell/KFC that was serving lunch. Yay! When we got condiments, we were treated to this magnificent display of OCD compulsion. We wondered which of the employees was feeling much better now. He cheered right up and settled in beautifully. Despite the fact that we had offered him water on the trip, he immediately drank almost 3 gallons of water and started munching hay. We let him rest and eat in the stall and it became clear that he was making up for lost eating time. He had hay on the trailer, but apparently it is not the same. 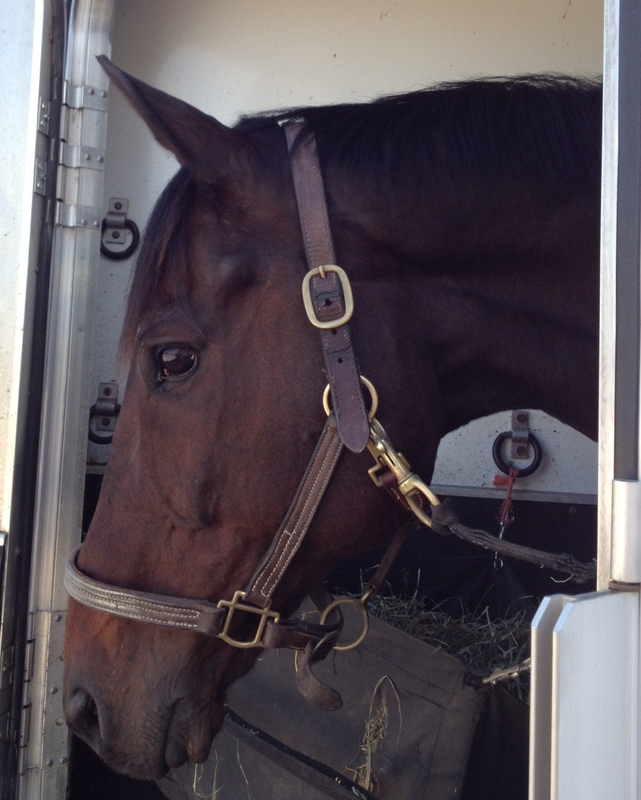 He had bonked his right front leg on the trailer above his fetlock, and created a bruise despite the wraps, but he seemed supremely unbothered by it, so we let him rest while we walked the xc course. More on that tomorrow. We will walk it again then. Then we went to the welcoming party, which was well-attended and nice. They acknowledged all the sponsors. Wow, that’s a lot of sponsors! and served a nice meal. Afterwards I tacked up Eddie and went for a hack. I don’t feel the need to drill dressage the day before, and I wanted to make sure I gave him time to stretch out and relax so we went for a hack up the gentle slope on one side of the park. He felt great and it was nice to escape the hustle and bustle. Then we worked in the ring for about 20 minutes. It was almost dark, about 7:30, and the ring only had a few people in it, so it was quite relaxed. Eddie did very well and is completely sound. Afterward, I hosed the leg for about 10 minutes and it was much tighter than it was before I rode, which was excellent. Everyone is in a very good mood here tonight and there is an anticipation atmosphere. I ride dressage at 3:24 tomorrow, so will hack him a bit in the morning, then bathe and braid, take a break and then have at it in the afternoon. Some time during the day I will walk the xc course twice. We ride xc around noon on Friday.